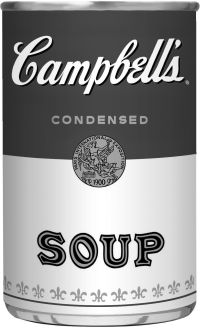 Black-and-white image of the classic Campbell's soup can. 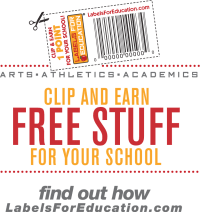 Full color Labels for Education "clip and earn" graphic. Full-color group shot featuring more than a dozen participating Labels for Education products. Customizable Labels for Education letterhead with a black-and-white logo, in Word format. Customizable Labels for Education letterhead with a full-color logo, in Word format. Black-and-white Labels for Education logo. Full-color Labels for Education logo. Labels for Education logo in orange on a white background. "Nourish Their Potential" logo in gray text. Full-color image of the classic Campbell's soup can. 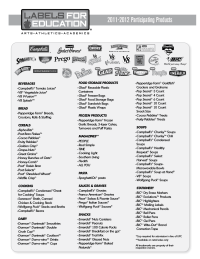 Comprehensive list of all participating Labels for Education products for 2011-12. 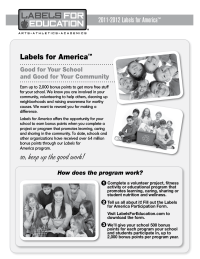 "Labels for America" informational flyer to send home with students. 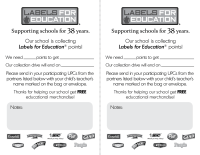 Two-per-page Labels for Education request for participation flyer that goes into backpacks to send home with students. 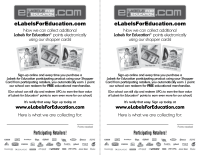 e-Labels for Education informational flyer to send home with students. 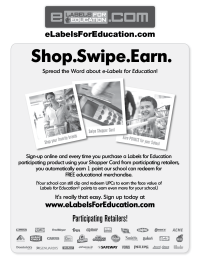 Two-per-page informational flyer on the e-Labels for Education program, to send home in students’ backpacks. 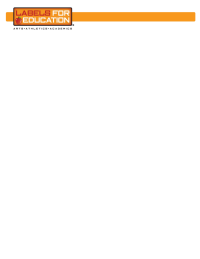 Print/share this fill-in-the-blanks letter with teachers /administrators at your school. 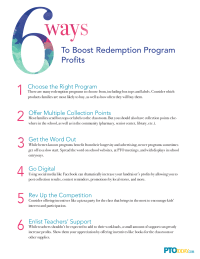 Encourage them to support the program to get points. Thank-you card for participation in the Labels for Education program.